How Long Are We Willing to Live With National Anxiety? Seventy-three percent of U.S. adults are dissatisfied with the way things are going in the U.S., according to Gallup's most recent poll conducted Sept. 6-10. In other words, three out of four Americans have a measurable degree of anxiety about the current state of the country or what to expect in the near future. In the same survey, 71% said they are dissatisfied "with the way the nation is being governed." We obviously live in a dangerous time of public unease about the country and the country's leadership. On the surface, today's negative national mood is surprising because it runs counter to significant positive economic developments such as lower unemployment with new job creation, all-time highs in the U.S. stock market and a new record for American household incomes cited as "the strongest sustained income growth this century." Gallup has been tracking the national mood since the waning days of the Carter administration in 1979, with many upticks and declines since then. However, dissatisfaction has now been consistently above 50% since early 2004. A majority of Americans have been discontented almost since the start of the 21st century. This deeply entrenched unease clearly opens pathways to election volatility and upheavals in policy debates. The word "dissatisfied" can be interpreted in many ways, by many different people. The dictionary synonyms, however, that could easily be applied to the current political environment include "aggrieved," "malcontent," "displeased" and "disgruntled." Buddhist texts (and some even earlier in Sanskrit literature) have defined the lack of satisfaction or unpleasantness in a culture as "a sense that things never measure up to our expectations or standards." With such feelings running rampant for more than a decade, it should not be surprising that leaders like Donald Trump would eventually emerge from outside of the political system, on a platform that challenges the entire political establishment. The recent Republican primary runoff election for the U.S. Senate in Alabama -- in which the establishment-backed candidate lost to an avowed Washington outsider -- is another case in point. According to The Wall Street Journal, Senate Majority Whip John Cornyn told reporters after that election that Senate Republicans are now preparing for a "climate filled with anger at Washington that could fuel primary challenges by outsiders." Dissatisfaction can be seen as anger's younger brother. Dissatisfaction can float on the surface or lie in wait. However, over time, it can turn to anger, erupting like an earthquake after long years of mounting pressure. The 2008 and 2016 election campaigns created havoc for the establishments of both political parties in those years and brought forth the unexpected candidacies of Barack Obama and Donald Trump. It should be noted that the satisfaction level in the U.S. was extremely low in mid-2008, at 17%, with a mind-boggling 81% dissatisfied in July of that year -- at least in part because of the ongoing recession at the time. However, nearly the same levels of satisfaction (17%) and dissatisfaction (82%) were recorded in mid-2016 as the electorate was making up its mind on the next transformative election. Obviously, strong political winds of change were blowing in both years. Looking at the past two decades, majority dissatisfaction started appearing more frequently in early 2003, after the 9/11 rally effect had subsided some. It then became the norm by January 2004 as the reality of anti-terrorism wars in Afghanistan and Iraq settled in. By mid-2007, dissatisfaction consistently surpassed 70% as the Iraq War continued, President George W. Bush's job approval rating sank to 29% and the economy slowed down just before the 2007-2009 recession. A decade later, however, with the Iraq War over and the economy on the mend, dissatisfaction remains high. One possible explanation for this may be found in Gallup's workplace research. Gallup has discovered that one-third of U.S. workers are "engaged" in their jobs, while the majority are "not engaged" or "actively disengaged." Those who are engaged are often in that category because they have a great leader at work -- or, more specifically, a great manager. And what makes a great manager? According to Gallup: "Great managers possess a rare combination of five talents. They motivate their employees, assert themselves to overcome obstacles, create a culture of accountability, build trusting relationships and make informed, unbiased decisions for the good of their team and company." The point is, if Americans perceive elected officials in Washington to be the nation's "managers," it's easy to understand why they remain dissatisfied with the state of the country, even as the economic fundamentals have improved. 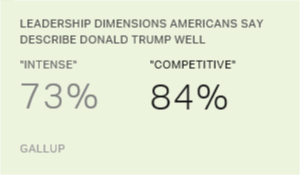 Continuing the analogy of an employee workplace to the U.S. political environment, Gallup's August Governance poll found "dissatisfaction with government/poor leadership" (20%) topping the list of what Americans perceive as the most important problems facing the country today. This was followed by mentions of healthcare (17%), immigration (7%), unemployment/jobs (7%) and race relations (7%). In the same poll, Americans rated a laundry list of U.S. industries, including the federal government -- and found 52% rating the government negatively and 29% rating it positively. This resulted in a net rating of -23, putting the federal government at the bottom of the list. By contrast, when Gallup first began asking Americans to rate U.S. industries in 2003, 41% rated the federal government positively and only 35% negatively, for a net rating of +6. U.S. politics today are indeed volatile and highly unpredictable because there persists an uneasiness about the way the nation is being managed, leaving us to feel adrift. The national mood -- with high levels of general dissatisfaction and, more specifically, dissatisfaction with the way the nation is being governed -- has persisted for the past 15 years, producing two presidential elections that, at least initially, rebuked the establishment. A perceived failure of government leadership at the top, a lack of confidence in the federal government itself and widespread partisan policy gridlocks appear to explain some of this unease. Alternatively, Americans' blame game against the national government could simply be a scapegoat for masking an even deeper fear. While the personal shock and powerlessness most Americans felt immediately after 9/11 may have faded, a deeper fear of the unknown may have set in. Appalling acts of domestic terrorism in the form of mass shootings, like we just saw in Las Vegas, may only add to it. One thing is for certain: If dissatisfaction stays above 70%, there will be more volatility and less predictability in future presidential elections, as the 2016 election vividly demonstrated. The U.S. political system is on a dangerous course with such high levels of persistent dissatisfaction. Political leaders should view Gallup's ongoing measurement of public dissatisfaction as a well-documented "early warning system."